SAN MARCOS, Texas - Record rainfall wreaked havoc across a swath of the U.S. Midwest on Sunday, causing flash floods in normally dry riverbeds, spawning tornadoes and forcing at least 2,000 people to flee. Officials said Saturday at least one person died in the flooding in Hays County, reports CBS affiliate KEYE in Austin. 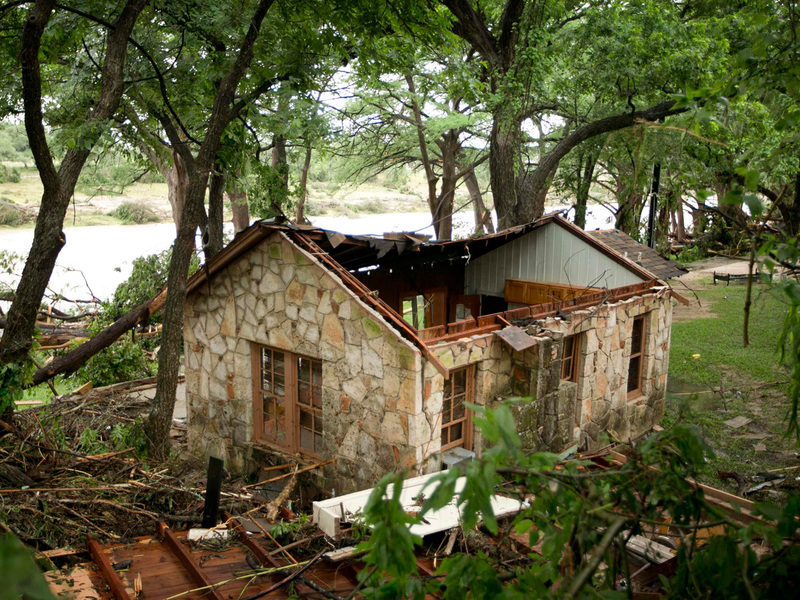 About 350 homes in the town of Wimberley were washed away by flash floods along the Blanco River, which rose 26 feet in just one hour and left piles of wreckage 20 feet high, Texas authorities said. "We do have whole streets with maybe one or two houses left on them and the rest are just slabs," Hays County emergency management coordinator Kharley Smith said, describing the town of Wimberley, about 40 miles southwest of Austin, where several people were missing. "It looks pretty bad out there," she said. Tornados struck, severely damaging an apartment complex in Houston, Texas, and a firefighter in Oklahoma was swept to his death while trying to rescue 10 people in high water. Rogers County Emergency Management spokesman Thomas Hudson said the firefighter died early Sunday morning. The man was standing in some water during the rescue, lost his footing and was swept away. Rivers rose so fast that whole communities woke up Sunday morning surrounded by water. The Blanco River crested above 40 feet, more than double its flood stage of 13 feet, swamping Interstate 35 and forcing parts of the busy north-south highway to close. Rescuers used pontoon boats and a helicopter to pull people out. In Dallas, the Trinity River climbed above 40 feet Sunday night -- well above its 30-foot flood stage. This means the river has hit "major flood" stage, CBS Dallas reported. In this stage, the city of Dallas and surrounding areas could see bridges closed, flooding, and a river the foundations of buildings in an industrial park. "The water rose so fast," said Rudy Olivo, 62, whose front steps in San Marcos were under water. This May is already the wettest on record for several cities in the southern Plains states, with days still to go and more rain on the way. The widespread heavy rains are being caused by a prolonged warming of Pacific Ocean sea surface temperatures that generally results in cooler air, coupled with an active southern jet stream and plentiful moisture from the Gulf of Mexico, said Meteorologist Forrest Mitchell at National Weather Service office in Norman, Oklahoma. So far this year, Oklahoma City has recorded 27.37 inches of rain. Last year at this time, only 4.29 inches had been recorded. This kind of sustained rainfall may end the prolonged drought that has gripped the region for years, since moisture now reaches about two feet below the surface of the soil and many of Oklahoma's lakes and reservoirs are full. But one month's weather can't predict future events, so Mitchell says it's still too early to tell for sure. Wichita Falls was so dry at one point that that it had to get Texas regulatory approval to recycle and treat its wastewater as drinking water dried up. By Sunday, the city reached a rainfall record, nearly 14 inches so far in May. The storm system was pushing northeast Sunday after moving across parts of Colorado, central and North Texas and most of Oklahoma. New flash flood watches were issued Sunday for western Arkansas, Missouri and parts of Kansas. About 1,000 people were evacuated in Central Texas, where rescuers pulled dozens of people from high water overnight. Tami Mallow, 41, gathered her three cats at a shelter in San Marcos while her husband put furniture on cinderblocks, and retreated to the second floor with electronics and other valuables as the floodwaters entered. "He told me there was 2 inches of mud," Mallow said. "I don't know what the cleanup process is going to be." Five San Marcos police cars were washed away and a fire station is flooded, said Kristi Wyatt, a spokeswoman for San Marcos, which imposed a curfew starting at 9 p.m. Sunday. Wyatt said some 1,000 homes are damaged in San Marcos, Wimberly and elsewhere in Hays County, a fast-growing area between San Antonio and Austin. A tornado briefly touched down in Houston, damaging rooftops, toppling trees, blowing out windows and sending at least two people to a hospital. The National Weather Service said the tornado struck with winds of about 100 mph at around 6:30 a.m. Sunday. Fire officials said 10 apartments were heavily damaged and 40 others sustained lesser damage. About 50 miles north of Houston, authorities were concerned with Lake Lewis overflowing, its dam may fail. Some 900 residents downstream complied with a mandatory evacuation order, the Houston Chronicle reported. In northeast Oklahoma, Capt. Jason Farley was helping rescue people at about 11:30 p.m. Saturday when he was swept into a drainage ditch. The body of the 20-year veteran was recovered an hour and a half later, Claremore Fire Chief Sean Douglas said. Oklahoma City set a new monthly rainfall total this weekend - 18.2 inches through Saturday, beating the previous one of 14.5 in 2013. Colorado also was water-logged. A mandatory evacuation notice was issued Sunday for residents in the northeastern city of Sterling, and several counties planned to ask the governor for a disaster declaration.